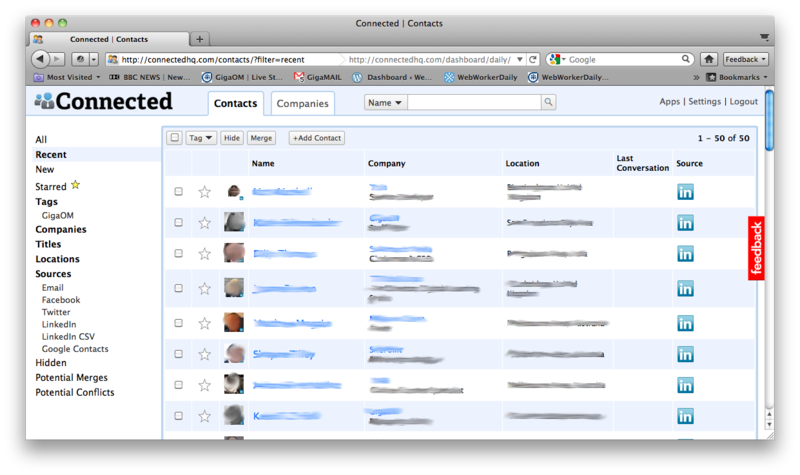 Finding it hard to keep up with contacts spread across email, Facebook, Twitter and LinkedIn? Connected is a new service that connects to your various online accounts and consolidates your contacts into a constantly updated online address book, with a single, easy-to-navigate interface. Once you’ve granted access, it will likely take some time for the initial sync to take place and for the contacts to be processed. Once that initial sync has been processed, any subsequent changes will be updated in Connected seamlessly. On the account homepage, you have two main tabs: “Contacts” and “Companies.” “Contacts” is an alphabetical listing of all of your contacts. Each entry shows the contact’s name and profile photo (if available), together with their company, job title, the source of the contact and when you last conversed with them. Clicking on a contact brings up a more detailed view, including recent updates (if available), mutual contacts and “Notes” and “How we met” fields. The “Companies” tab allows you to filter contacts by company. It’s a nicely-designed interface that’s easy to use. There’s a Gmail (s goog) sidebar to access Connected contacts from with Gmail, while there’s also a mobile-optimized version of the site to use on smartphones. Connected can also send you a daily email with useful info to help you to stay connected to your network, and such as updates from you contacts, job changes and birthday reminders. With Etacts being shut down, Connected’s main competitor is probably Gist, a social CRM startup that’s been in beta for some time (see our past coverage of Gist here). 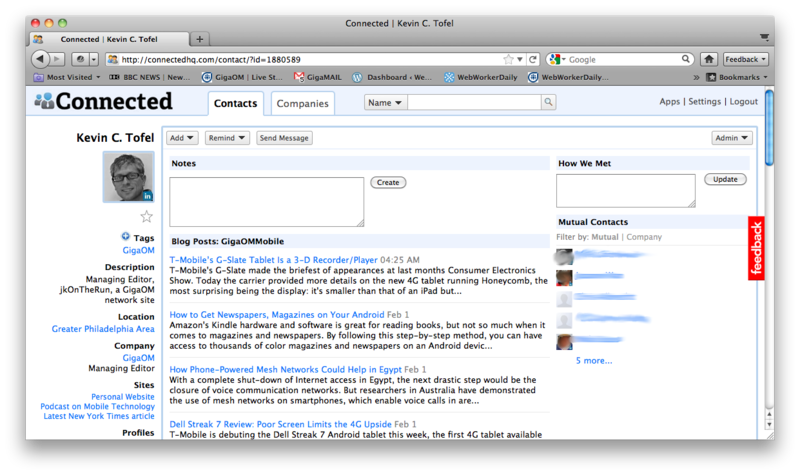 Connected is nicely designed and has a cleaner interface than Gist, so it will probably be easier to get to grips with. However, after a 14-day free trial period, Connected is pretty pricey for an online address book at $9.99 per month, while Gist is currently free. And although Gist will likely introduce a paid premium offering when the product moves out of beta, it hasn’t been announced yet. Additionally, Gist can connect to Lotus (s ibm) and Outlook (s msft) email accounts, while Connected can only connect to Gmail accounts. I’d recommend Gist over Connected, even though the latter is a nicely designed app. @Buzz, the real key in Connected is that it fundamentally understands that your relationships go with you wherever you go – I have found the Facebook+Google+Twitter+everything else interactions to be absolutely fantastic. You missed Plaxo. Because Plaxo has been around for so many years and took a turn into the social network space, people forget about the power of its unified, secure, synchronized address book, which is really at the core of its business. Plaxo has shown a re-dedication to the smart address book, supported by numerous feature releases over the past year: iPhone, Blackberry, and Android solutions; Outlook 64-bit support; Outlook for Mac; enhanced Gmail & Google Calendar sync; etc. Look for Plaxo to move back into the leadership position in this space in 2011. Great piece Simon. Disclaimer the Gist guys are my pals. But one idea you alluded to is that Gist works with Outlook. It does and does so brilliantly. What we have learned at ActiveWords is that people who use Outlook are using to paying for software/services, those who use Gmail, expect it to be free. Building a product that only deals with Gmail is a non-starter, a failed enterprise. People routinely download our product with their Gmail accounts and then buy with their Outlook accounts. I think that’s a good point, Buzz. That may change if more enterprise customers switch to Google Apps accounts, though.